The newest bridge built to cross the Neva River is the only one that is not a drawbridge. The Bolshoy Obukhovsky Bridge was opened in 2004 and is part of the Ring Road - the freeway system circling the city. We travel on this bridge every time that we need to get to the airport from our flat. The Blue Bridge, the widest bridge in the city, is 97.3 meters wide - wider than the length of a football field. Spanning the Moika river, the daughter of Nicholas I, Grand Duchess Maria Nikolaevna wanted the bridge to be as wide as her palace behind it, so in the mid-1800s it was built to make her happy. Today the bridge holds a large parking lot. By looking at the picture, you can tell how it got its name. The bridges that cross the canals are generally smaller and very low. Last August we took a river cruise in the city to see a different view of the city and bridges. Going under several of the bridges, we had to duck our heads so that we didn't bump them on the low clearance. Some of the bridges were built in a rather ornate fashion as you can see in the picture on the right. Built in the18th Century, the Lomonosov Bridge was very typical for that era. Many of the bridges have statues near the ends of them - lions, sphinx, griffins, and gargoyles. 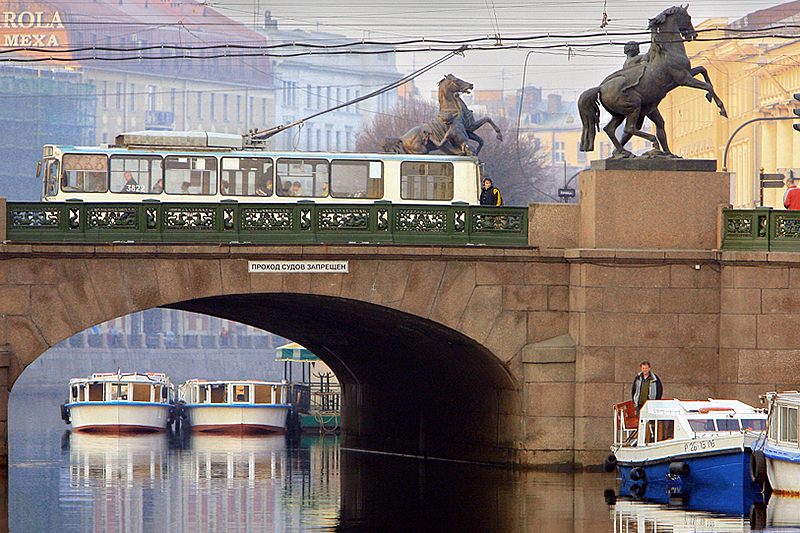 The Anichkov Bridge on the main street in St. Petersburg has four horses - one on each corner. The horses appear with horse tamers trying to control the bronze figures. They're quite amazing to see every time we ride the bus downtown. I'm sure we'll never see all of the bridges in the city, but we'll give it a good try.